Over recent days I have shared some of the photos of birds seen during our recent hot spells of weather. 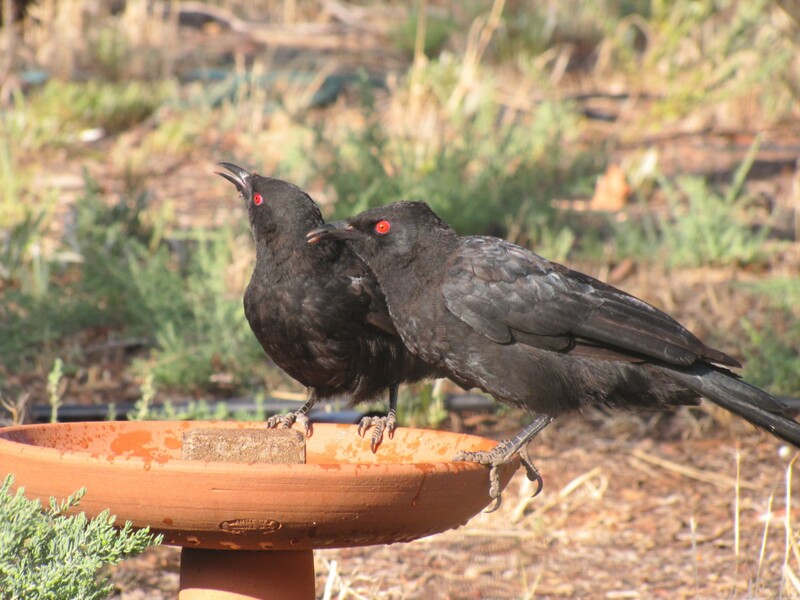 Our bird baths are popular with the resident bird population and we can observe anything up to a dozen species in a ten minute period. 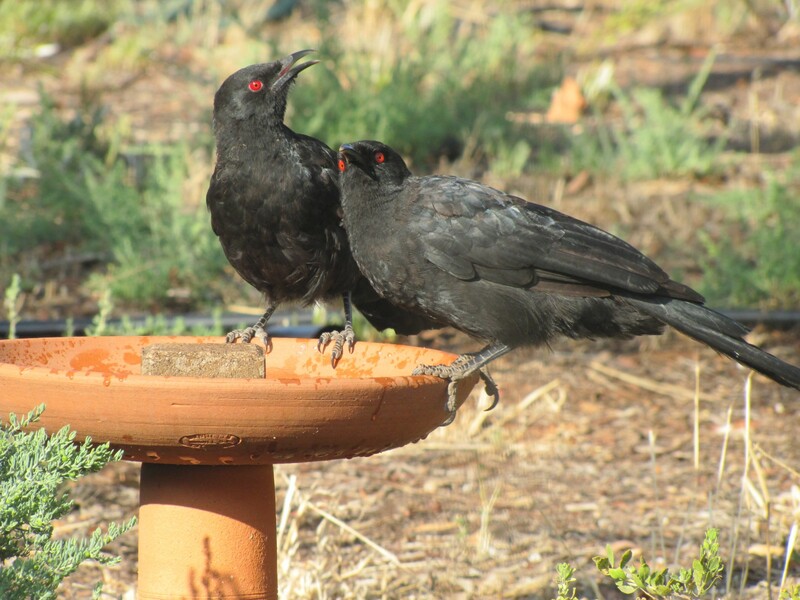 Bird Bath Central can get both busy – and noisy. 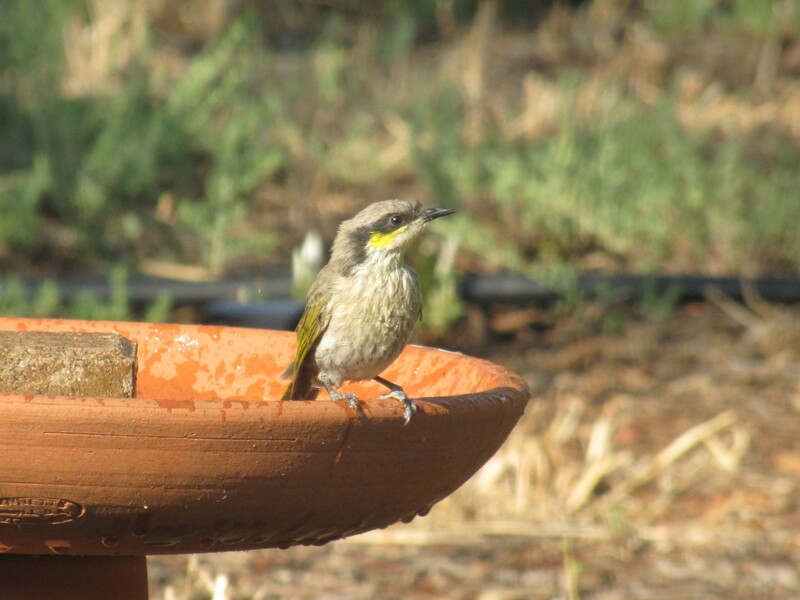 One of the quieter species to come for a drink would have to be the Singing Honeyeater. They come individually – and occasionally in twos and threes – and never make a great fuss. certainly not like the gregarious New Holland Honeyeaters. I have observed that they tend to come when no other birds are around. The much larger Red Wattlebirds and Australian Magpies are the usual dominant birds, bossing the other species away. And then we get those interesting birds like that not shown in the photo below. Sometimes the birds are just too quick for my camera. 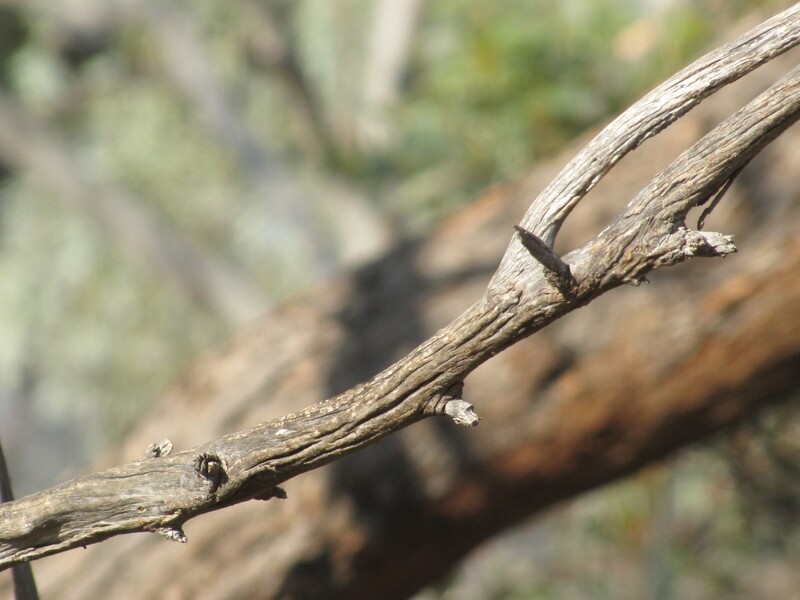 I must make a collection of photos of rocks, twigs, branches and fence posts showing where a bird has just been – but escaped before the shutter was released. We’ve been having some really long spells of hot weather recently, right up to the last few days when autumn should be gently sneaking in, along with cooler, more mellow days. During the hot weather I like to keep up the water supply to our various bird baths in our garden. Most of the birds appreciate to fresh water and come for a drink, or a bath and often both. It is not unusual to have a parade of ten or a dozen different species attend the water source in a ten minute period. It can become a busy, noisy airport at times. When I choose to write or read in our sun room with a good view of several bird baths, I will often have the camera at the ready. The passing procession of birds is a wonderful distraction, but it is times like this that I also get some excellent photos, like those of two White-winged Choughs last week. 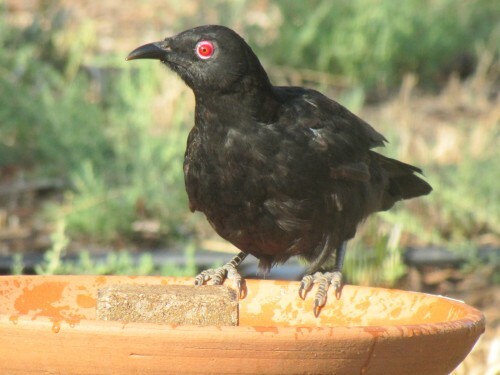 With the camera on 20x zoom, their bright glowing red eyes take on quite an evil look. This post was updated on 20th September 2015. I have written in recent days about the hot weather we are having. As I write this a cool change is on the way, and storm clouds are gathering. So far the clouds have promised much – and delivered nothing in the way of refreshing rain. Still, the promise of cooler weather over the coming week is reassuring. A little while ago I was having a coffee while doing some reading. I looked up to think about what I was reading and suddenly got all excited by what I saw out through the window. I grabbed my binoculars and raced outside. About 6 Fork-tailed Swifts (Pacific Swifts) were swooping at great speed across the cloudy sky, following the storm front as is their habit. Within minutes they were gone, so there was no time to try for a photo – they were too high up and moving too fast anyway, so I’m not disappointed. You can see a photo taken by someone else here. On checking my records this is a new species for my home block list. Previously I had seen Needle-tailed swifts on one occasion. Two swift sighting here in nearly thirty years. No wonder I was excited. The most common thornbill species in our garden is the Yellow-rumped Thornbill. 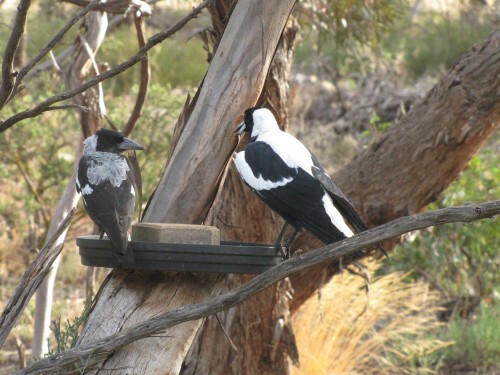 This is a resident breeding species and we see small flocks of up to 20 almost every day. If we searched our whole property we would probably see them every day. Less common is the Yellow Thornbill shown in today’s photos. This species, also known as the Little Thornbill, is a regular visitor. 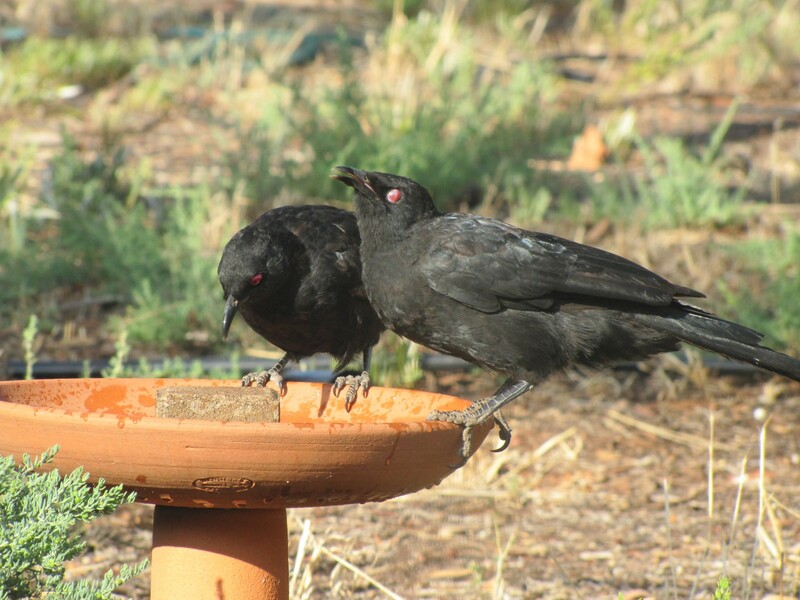 On a recent hot day a small flock came hesitatingly to our bird bath. Some of the larger birds such as the honeyeaters can be quite bossy and this makes this tiny visitor nervous and flighty, so I was pleased to get a series of close up photos. As an added bonus, I managed to catch one of them landing but still in flight – check out the last photo below. You are currently browsing the Trevor's Birding blog archives for March, 2013.